Here is a list of 5 best free PPT to JPG converter software for Windows. These PPT (PowerPoint) to JPEG converter software let you convert PowerPoint Presentations into JPG format easily. All these software are available free to download for your Windows PC. Apart from converting PPT (or PPTX) to JPG, some of these also let you convert PowerPoint slides to other common image formats, such as: BMP, GIF, PNG, TIF, RLE, RAS, EMF etc. Out of these 5 converters, the one that I like most is Free office Document To Image Converter. Apart from converting to JPG, it supports output to many other common image formats as well. You can also try these best free PowerPoint Viewer, PowerPoint to Flash, and PowerPoint to PDF Converter software. Free Office Document To Image Converter is a free software which lets you convert Office documents including PowerPoint files into JPG images easily. When you run the program, it first checks for running instance of Office program and asks you to close it or it closes it when you click OK button. 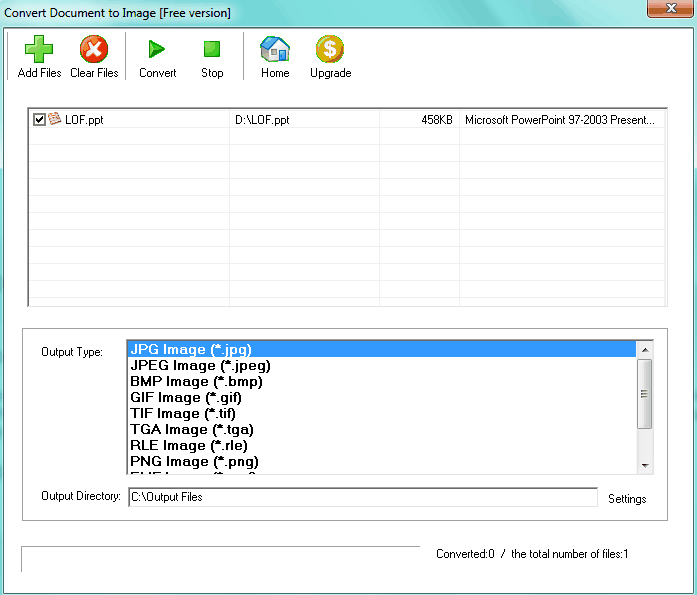 To convert a PPT or PPTX to image, click "Add File" button to select a file by browsing. Now click JPG from "Output File Type" from Image tab; select the output Save Folder and click Convert button to start the process. You can set the output folder of your choice too. All the slides of your PowerPoint file will be saved as separate JPG files in the output folder. It has a limited functionality in the free version. When exiting this program, it asks you to register but you can ignore this message by clicking Close button. Other supported output formats are: BMP, GIF, TIF, TGA, RLE, PNG, EMF, and WMF. You can also set the output filename pattern according to your choice. If you check "Show output folder when done", it will open the output folder for you. By default it saves the converted images in "C:\Output Files" folder. Convert Document to Image is a free and easy to use program which lets you convert office documents, including PowerPoint Presentations into various types of common image formats. You can convert PowerPoint files (PPT, PPTX, or PPTM) into JPG by using it. Load the program and click "Add Files" button to select input file, select the output format as JPG from the "Output Type" tab. Now change the output directory or leave the default as is. Finally click Convert button to start the process. Every slide will be saved into the output folder separately as a JPG image. Various other supported output image formats are: JPEG, BMP, GIF, TIF, TGA, RLE, PNG, EMF, WMF, and PSD. Other input supported formats are: DOC, DOCX, DOCM, XLS, XLSX, XLSM, RTF, and TXT. Free PowerPoint-PPT to Image Jpg-Jpeg Bmp Tiff Png Converter is an easy to use freeware for converting PowerPoint files to JPEG or other common image formats. When you run this free converter, it shows a dialog box asking to choose the version of the program (Free or Share). You can click "Free version" and click OK to start it. Now to convert a PowerPoint file into Image(s), you can click "Choose File" from File menu to select your input file. Supported input formats are: PPT, PPTX, and PPTM. Now at Output Format tab, choose JPG as output. Select the Output Path and finally click Convert button. All the converted JPG files will be saved in the selected output folder. Other supported output picture formats are: BMP, GIF, TIF, TGA, RLE, PNG, EMF, and WMF. You can also check/uncheck the "Open output folder when finished" button as per your need. You can convert only one file at a time in the free version. Other functionalities are also disabled in the free version. The program interface language can be switched between English (Simplified) and Chinese (Simplified) from Options menu. It asks you to register the program when exiting. Libre Office is a versatile Office Suite and has various useful set of programs. Its Libre Office Impress is a free presentation software, and also has a feature of converting PowerPoint files into JPG images and is an alternative to MS PowerPoint. You can use it for converting your PowerPoint file into JPG (or in other supported image formats) easily. Just open the PowerPoint (PPT, PPTX etc.) file with it and click Export from File menu. Now from the "Save as type" choose JPEG, type the name and click Save button to save the current slide as JPG file. There is no batch method to convert the complete file in one go, so you have to go to the slide first and then follow the same procedure sated above. Other output image formats are: BMP, EMF, GIF, PNG, TIF, RAS etc. You can check or uncheck "Automatic filename extension" button if required. Overall this is a nice program which lets you convert PowerPoint slides into JPG images, but one slide at a time. This conversion feature is also available in other Free Office Suites like Open Office etc. Office Convert Document To Image Free is another software in the list. It is a simple program which lets you convert Office documents including PowerPoint presentations into various common image formats. You can convert PowerPoint file (PPT, PPTX, or PPTM) to JPG easily by using it. First you have to close all the instances of MS Office and then run this program, otherwise it will close them automatically. Now click "Add File" button from the File menu to add the PowerPoint file to its list. Now choose the desired file format from the "Output File Type" tab (JPG in our case). Choose the Save Folder by browsing. You can set the output filename also, if required. Finally click Convert button to start the process. All the slides in the PowerPoint presentation you choose will be converted into separate JPG images in the output folder. Other image output formats it supports are: BMP, GIF, TIF, TGA, RLE, PNG, EMF, and WMF. The program comes in other languages also and you can select the respective language from the Settings menu. It asks you to register the program when exiting, but you can just click on Close button and ignore the message.